We are pleased to announce that we have recently secured a Framework Agreement with Central Bedfordshire Council to supply Display Energy Certificates (DECs) to schools and other local authority buildings. Legislation requires that every school with a floor area larger than 500m2 must have a Display Energy Certificate. The A3 sized chart must be displayed in a prominent place which is clearly visible to the public. There is also a requirement to hold (but not display) a currently valid Advisory Report (AR), which contains more detailed statistics about the energy performance of the building, along with suggested improvements. 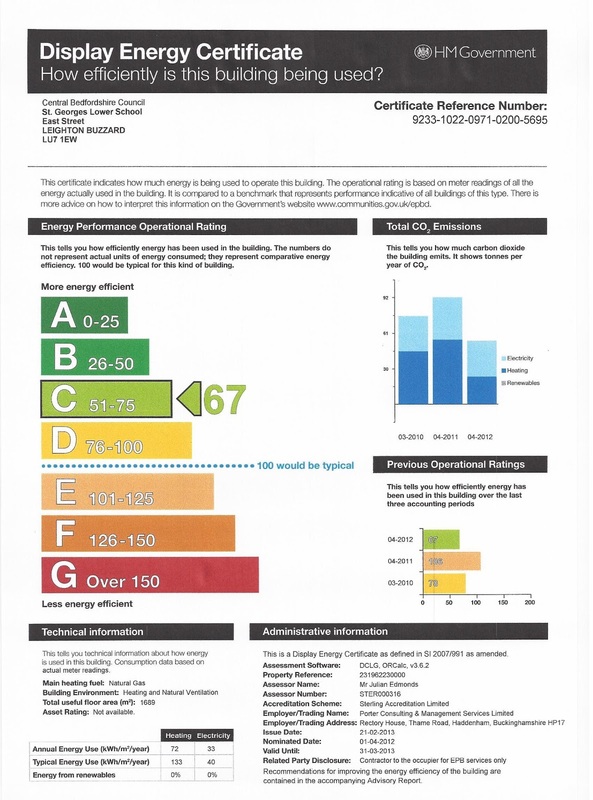 The certificate uses a scale (from A to G) to indicate the energy efficiency of the building, with A being the most efficient. For most buildings, as a new report has to be generated once per year, the intention is that building owners will use the information to steadily improve energy performance. If your DEC is ready for renewal, or if you need a DEC for the first time, then we can assist. Our energy assessor will visit your premises to carry out the necessary inspection. He is CRB checked and fully accredited to issue the documentation, all ready to display. Simply contact our office on 01844 202932 to book an appointment. This entry was posted in DECs, Display Energy Certificates on March 27, 2013 by admin.